Getting the right copier for your business is extremely important. There are so many different solutions to a businesses printer and copier needs. However, not every solution works for every business. In fact, getting a copier lease at all might not be the right way to go. 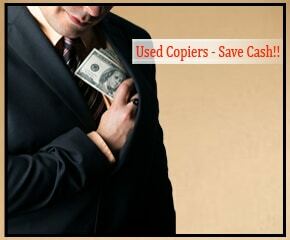 That’s why at Denver Copier we offer the best selection of used copiers in Denver Copier. Getting a used office machine is seen by many people to be an unnecessary risk. They think that they are going to get stuck with problems that someone else never took the time to finish. Luckily, that isn’t the case at Denver Copier. We make sure that all of our use copiers are in great condition and ready to be used on day 1. We believe that used copiers can be the right decision for any number of businesses. Not everyone wants to be on a long lease, or they aren’t sure where their business is going to be in a few years. Used copiers can be the obvious choice for those who want an office solution with very few strings attached. If you want to know more about getting a great used copier in Denver Copier then please reach out to our great staff. We would be happy to show you our wide range of copiers that could suit your needs. Don’t let the idea of getting a used office machine scare you. Keep your options open and you may be pleasantly surprised about what we have to offer.